In recent drafts, Georgia has provided some strong prospects for the Twins organization. Byron Buxton was the number two overall pick out of Georgia. Fans saw his ability to impact both sides of the ball in 2017. Now the Twins have another center fielder from Georgia who is making his way to Target Field. 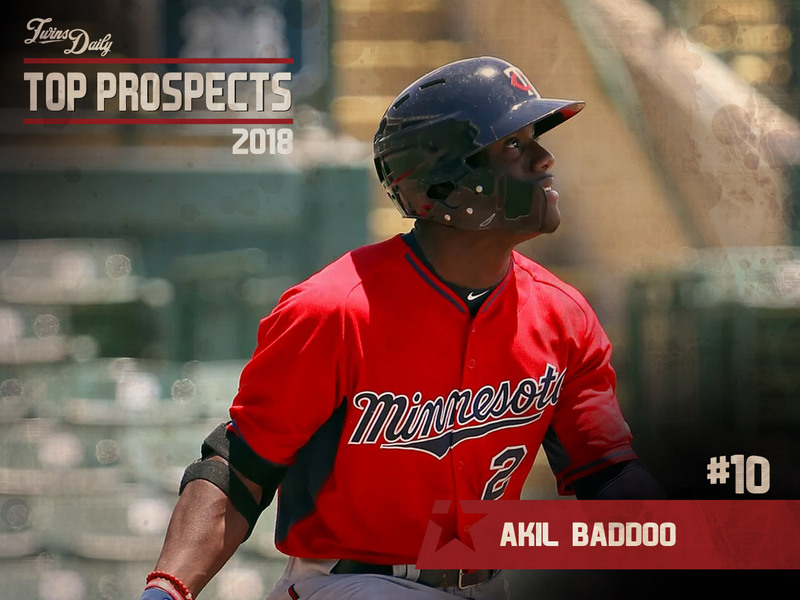 Akil Baddoo was taken by the Twins with the 74th pick of the 2016 MLB Draft. As a 17-year old, he struggled during his professional debut, hitting .178/.299/.271 with a 36 to 18 strikeout-to-walk ratio. He was almost three years younger than the competition in the GCL so he’d start there again in 2017. Baddoo broke out in 2017. A year after struggling to a .570 OPS in the GCL, the 18-year old mashed the ball for both rookie league teams. In his second stint in the GCL, he hit .267/.360/.440 with eight extra-base hits in 75 at-bats. He caught fire after being promoted to Elizabethton where he hit .357/.478/.579 with 20 extra-base hits in 126 at-bats. He also showed a very advanced approach at the plate with a 32 to 36 strikeout to walk ratio. Baddoo’s OPS ranked second in the Appalachian League. Only 15 of his plate appearances came against younger pitchers and he posted a .954 OPS when facing older competition. Defensively, Baddoo has the athleticism to play all three outfield positions but the majority of his starts come in center field. During the 2017 campaign, he didn’t commit an error in over 300 inning in center. In the E-Twins’ Appy League Finals-clinching victory, Baddoo went 2-for-4 with a double, a triple and a walk. Following his outstanding season, Baddoo was named the Twins Daily Short Season Hitter of the Year. Leading into last season, Baddoo added 15 pounds and continued to show speed on the base paths. He entered last season at 5’11 and 195 pounds. Since he is still a teenager, there could be room to improve his strength and add more power. For him to continue to trend toward being a five-tool player, he needs to find the right balance of adding strength and not sacrificing speed. Obviously, he will need to show that 2017’s performance at the plate wasn’t a fluke. Almost all of Baddoo’s power came against right-handed pitching where he compiled a 1.013 OPS. His numbers were still strong against lefties (.328/.426/.414) but he only collected five extra-base hits. With more experience, he will hopefully be able to hit for more power against southpaws. While his defensive skills have been strong, his arm continues to be an area needing improvement. Throughout his minor league career, he’s only had one outfield assist and it came when he was playing right field. He might need to shift to a corner outfield spot if his arm doesn’t improve. Baddoo should get his first taste of full season action during 2018 especially based on his time with the E-Twins. If he continues to hit like he did in 2017, there is a chance he could crack into some top 100 prospect lists during next offseason. He could spend 2018 in Cedar Rapids with a chance to make it to Fort Myers in the second-half. Baddoo seems like he could be a similar player to former Twin Matt Lawton. The upside is big with Baddoo. He is pretty ripped at 195 pounds. Looking forward to seeing pictures of him in Fort Myers! The only thing not to like about this guy is he is only 5-11. Hard to get too much bigger to add power without sacrificing speed and agility. Maybe he still will grow a couple inches, but another Matt Lawton wouldn’t be a bad thing. I'll be sure to take a bunch... Ha! Another Matt Lawton would be terrific, and that's probably a fair comp for now... Good on base skills, good speed and good power. I like it. One of my favorite guys. I expect he'll be on national rankings a year from now. Hopefully he continues with the strong eye at the plate and gathers a lot of walks. I was hoping a little more toward Kirby Puckett.Still a good comp.Thanks. Yes, I had a left handed Kirby as the best case scenario. Wouldn't it be nice if they all turned into Hall of Famers? The buzz on Baddoo is encouraging. Thanks for giving a warm ray of hope on a bitter cold February morning. hope that strength translates on the field! Agreed with above, another Matt Lawton would be a nice piece to have. He doesn't skip days at the gym, eh? He might be the prospect I'm most excited to follow this season. It'll be interesting to see where he end the season. I know it's only instagram, but it leaves a positive impression.It appears his game, keeping himself in top form for his game and his family/friends are what's important to him.Not Nuke Lalooshing around. I don't think I've ever heard Nuke used as a verb.Well played. Seems the Twins (pre-Falvine & currently) have drafted, not only very talented players in the past few years towards the top of the draft, but driven kids with good heads on their shoulders. Akil's on my top 5 to watch list this summer.Looking forward to it.Hope he likes pork tenderloins!! !Cedar Rapids is gonna be stacked!!! I don't think I've ever heard Nuke used as a verb. Perhaps you didn't live during the Cold War. But, you've never made microwave popcorn? I see Bo Jackson all over him (albeit an inch or 2 shorter.) Baddoo is built like a tailback. Grade 80 name, that somehow makes me more confident in his future than if his name were Bob Brown. I love our farm system right now. We may not have a Buxton down there at the moment but our depth is going to be really interesting to see evolve this season. Seems there are several guys who could make a leap into top 50 prospect territory. Seth: (8), Nick (14), Cody (13), Tom (10). I hope he reaches the bigs soon so we can hear Sid Hartman try to pronounce his name. Sid is going to live forever. Put him on a diet of all mac n cheese and chicken wings- pack it on, and he could be the left-handed version of Kirby. I've heard Nuke as a verb, but definitely not Lalooshing.